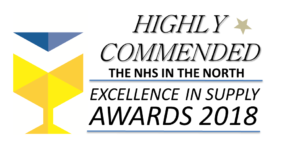 We are extremely pleased to be shortlisted for the NHS Excellence in Supply awards. The awards promote and celebrate private sector organisations working in partnership with the NHS to deliver high quality, effective and efficient patient care; helping the health service to do more for less. The nomination comes from the work Select Medical is doing with Mental Health Trust Units across the North West. In-line with our C3 ethos, we have implemented the introduction of bespoke SelMed Crib 7 Static mattresses across multi-sites, paying particular attention to the needs of the cared for, carer and care provider. In practical terms this has meant a full project management service. Auditing, backed with a traffic light scheme, has helped identify the mattresses that required immediate attention. Our SelMed Crib 7 mattresses come with sealed covers to meet the stringent requirements of mental health units. They’re also clinically effective, comfortable and safe, putting the carer and cared for at ease. This is an on-going project. We continue to manage the process, delivering new mattresses and taking away old mattresses at the same time, causing minimum inconvenience to staff and patients. Enhancing staff knowledge has also been key, with Select Medical delivering education, training and support to all staff and stakeholders. We’re now looking forward to the Awards night. The Awards Ceremony is taking place at the Midland Hotel, Manchester on 4th October 2018. Here’s hoping we come away with the Award! Either way, we’re extremely proud to have been shortlisted and believe this is a reflection of all the hard work and passion our staff put into the work they do.